The biggest fleet to take the best of the baroque architecture of Retiro Park and its gardens. A present for your senses! Starting in the center of the city, very close to Plaza Mayor we can either go down through the Literary Quarter where Góngora and Quevedo had street verbal disputes to demonstrate their word domain, where Miguel de Cervantes lived and is now resting. We will have to get across all the District of the Austrias up to el Retiro, through its most noble places. 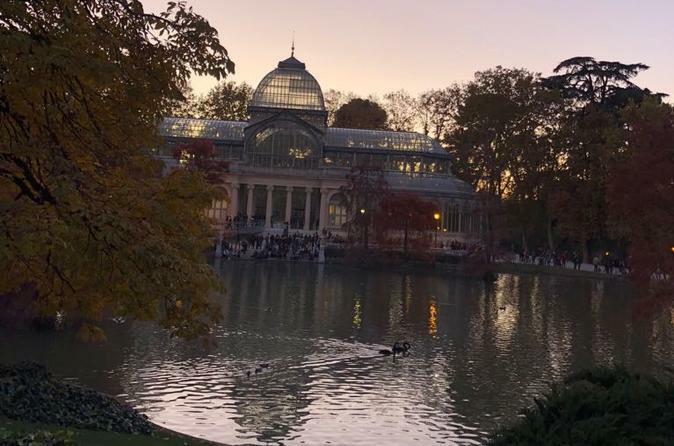 Retiro means “retreat”, a quiet and peaceful place that King Philip IV ordered for his getaways. It offers nowadays cultural, leisure, and sport activities to all people, those from Madrid and those visiting. It’s bookfair on the fortnight from May to June is one of the best anual attractions, and all along the year it holds exhibitions and races. Stop and row at the Great Pond or enjoy an exhibition at the Crystal Palace, built for the Philippines Exhibition on 1887. The historic rose gardens, the perennial gardens or Cecilio Rodriguez Gardens. Historically it used to have a Monastery and on last century our zoo was located there too. And on the way back we will see the Alcalá Gate and Cibeles Square and head up Alcalá Street through Puerta del Sol, and back to rest and take a beer on any terrace in the city center.